So i really loved the last setup i had: a KRK 5.1 setup with 3x RP6 ‘s and 2x RP5’s. I used that the longest time and really got familiar with it … enjoyed using it. But then I changed my Job, I did go freelance (as you might know I work for all kinds of projects and people now – like for ScruffyTV (a lot of Podcast work there in addition to other stuff) and even more so on more audio based / orientated stuff) So anyway, I kinda had to leave my beloved KRK setup at my old workplace. The quite common M-Audio BX5 and the Samson Resolv A6 both of which got good some notes (so to say) for the low price they go for. also they are missing a bit in the higher mid range and maybe a little bit of too much emphasized in the 150-300 Hz area but that really shows only in a few tracks (and if u don’t have a perfect placement of the speakers). Over all they are quite good sounding. They have an open sound. For the price range analytic enough to get pro work done. The Stereo-filed is ok, actually good for a Studio-speaker in that price range. I actually was surprised how much really i can hear single instruments in some tracks / mixes. They have a lil issue with some white noise in “Standby” but that actually should be not a big issue for mixing at all. You only will notice that when you have nothing playing. And if you want to dial in stuff like “noise reduction” on some audio recordings you always could use headphones to make sure its it ok, but really it’s not that bad at all – really just a little bit white noise. Now, these speakers are quite big and kinda heavy, so for smaller rooms and for people “on the road” a bit too much maybe. So for a common Edit-Suite setup it might e bit tricky to get a good placement. They are not as uncomplicated to place to get a good sound out of them. I always had the feeling the placement of the KRK’s was less “complicated”. It kinda was like the KRK’s sounded good everywhere. Anyways, sometimes its better to get smaller speakers (like the KRK RP5 RoKit’s – in that size really nothing comes close in the price range). But I did read that the smaller Samson Resolv A5 are not as good as the these bigger Resolv A6. So that is not really an option. So, over all quite good speakers for the money. Are they as good as KRK RP6 RoKit’s? …not really. But the Resolv A6 are really usable esp. if you just get stared and have to keep your start-investment costs low. If you get experience with them, get to know them – so to say – you really can get work done! 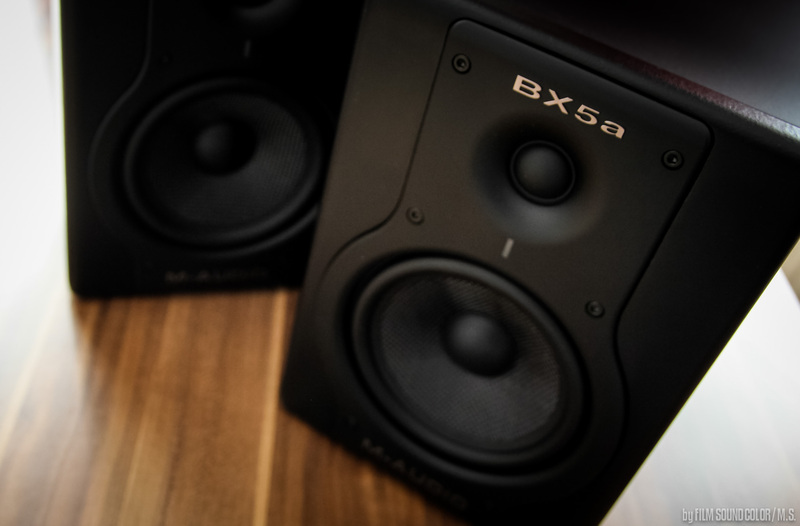 The other candidates are the M-Audio BX5 – 177 EUR for a pair – (i got the older version so the newer BX5a might be a bit better but overall these are the same). The BX5’s are well made and actually have a good size for smaller rooms and the usual editing suite setup. In terms of Sound, I’m not so sure. 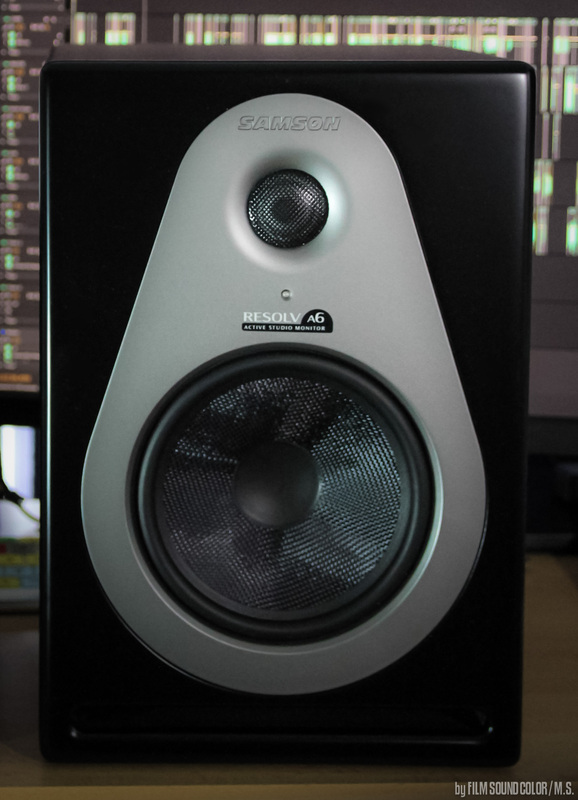 Even though they are quite powerful for the size and have a good strong low-end for the size, they really have a noticeable lag in the mid-range, so they really don’t sound open at all. if you have an orchestral track (movie score) for example there really is all the “wood” and open sound missing… you really have a hard time getting the room and clearness of a mix. The high range is actually good, maybe a bit too “fine” but quite analytic with a somehow odd “rolloff” tho’. It sounds too sharp in a way. So in the end I have to say they are not as good as the Samson Resolv 6A. One good thing is tho’ that these speakers are quite common in home studios and even edit suits so people are used to them and it might be possible that you “have to” / might use them at some point. Technical specs are ok: it’s a overall 70W speaker with a 5″ woofer and 1″ tweeter, magnetically shielded, balanced XLR and balanced/unbalanced TRS inputs, volume control (that actually works good and smooth). The low frequency port is on the back of the speaker … what in my experience is tricky / not so ideal esp. if you don’t have “perfect” placement of the speakers. (too close to a wall / in a corner) so i kinda noticed a bit of a low end “overload” for some tracks i played … not too bad just something you might keep in mind. In conclusion: If you don’t have the funds, have to save some money you really could get away with the Samson Resolv A6. They really sound good/ok for the money. If you have the funds go with the KRK RP6 RoKit G2 tho’. I really would not recommend the M-Audio BX5(a) even though they are common (oddly ;-)) and small they really just sound not right / not good enough to compete with the SAMSON’s or even more so with the KRK’s at all. At the end of the day – if you really want to deliver a good mix – you really should check speakers for yourself – listen to your reference tracks on them. As for all speakers – even the expensive ones – you have to get to know them, you have to get experienced with them (so to say). But don’t get any random audio speaker that doesn’t sound “right” for you.